Terence has been working in maritime education and manning industry for more than 25 years. 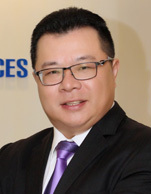 He was lecturer in COSCO Qingdao Ocean Shipping Mariners College and later on joined China Shipping Group as Managing Director of its manning arm MASES Singapore before he founded Singhai in November 2004. Terence graduated from Shandong University of China with a BA in Electronics Science. He obtained his MBA from National University of Singapore, and MSc in Maritime Studies from Nanyang Technological University. Singhai has developed a dedicated team consisting of professionals and experts with rich experience in seafarers manning and training. Our Managers mainly consists of seagoing masters and chief engineers sailed in the respective international shipping companies. Our frontline staff are graduates from maritime universities and colleges.